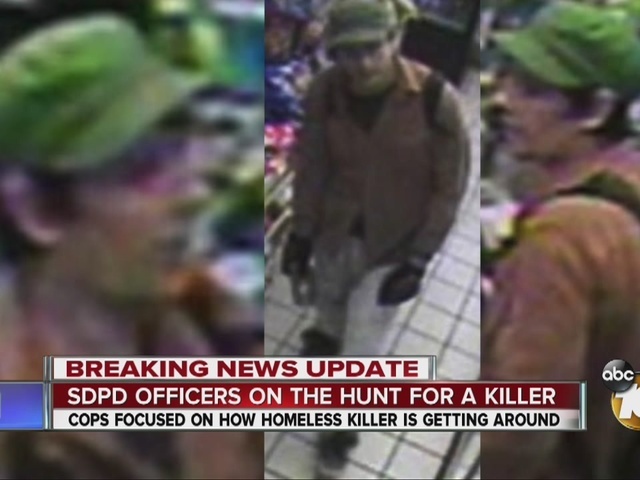 Police are focused on how this homeless killer is getting around. 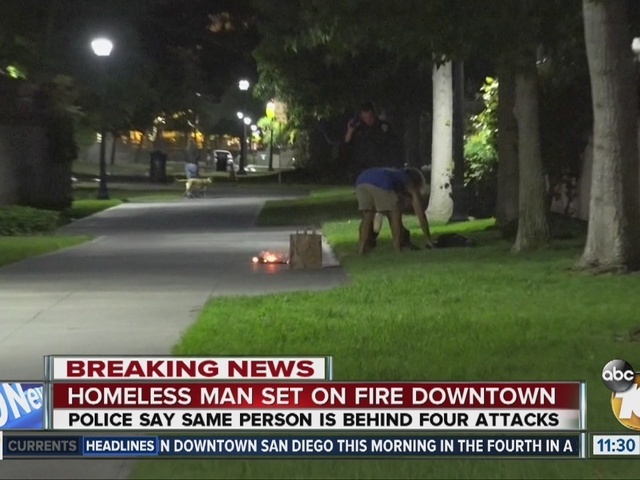 SAN DIEGO - An unidentified assailant set a transient on fire near Horton Plaza Wednesday morning in the fourth attack in a four-day spree of violence that has claimed the lives of two homeless men and severely injured two others . Following the latest assault, which left the 23-year-old victim hospitalized in grave condition, city leaders sought to assure the public that they were doing all they could to capture the perpetrator of the brutal crimes. 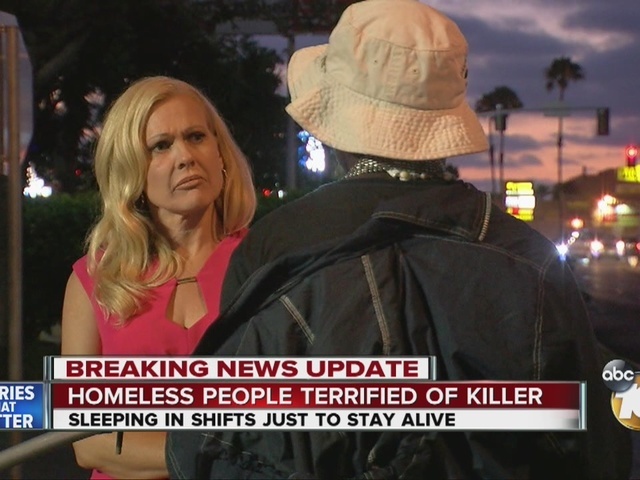 "I want everyone to know that this series against our homeless is the highest priority for our police department," San Diego police Chief Shelley Zimmerman told reporters during an afternoon briefing. Zimmerman described the spate of early-morning attacks as "despicable" victimization of defenseless people. "These evil acts of violence are some of the worst that I have seen in my 34 years in law enforcement," Zimmerman said. "This killer has targeted some of our city's most vulnerable citizens while they are asleep." Witnesses to this morning's assault saw someone crouched over what they initially thought was a flaming pile of clothing in the area of Broadway and State Street shortly after 5 a.m., according to police. Realizing that it actually was a person on fire, one of the bystanders hurried over and pulled a burning towel off the victim, Capt. David Nisleit told reporters. The assaulted man was hospitalized with critical injuries. The captain said "there is no doubt in our minds" that the same man -- images of whom were captured at a convenience store near where the first victim was found -- is responsible for all four crimes. The body of the first victim in the series, 53-year-old Angelo De Nardo of San Diego, was found in flames in an open area off the 2700 block of Morena Boulevard in Bay Park about 8 a.m. Sunday. An autopsy determined that he had been killed prior to being set ablaze. Police have declined to release his cause of death. Witnesses to that attack told investigators they saw a man running across nearby Interstate 5, carrying a gas can. Shortly before 5 a.m. Monday, transient Manuel Mason, 61, was found bleeding from stab wounds to his upper body in the 3700 block of Greenwood Street, near Valley View Casino Center in the Midway district. He was hospitalized in critical condition but was expected to survive. Less than 90 minutes later, another drifter, 41-year-old Shawn Longley, was found dead at a park in the 2500 block of Bacon Street in Ocean Beach, about three miles from the scene of the second assault, according to police. The cause of his death has not been released. 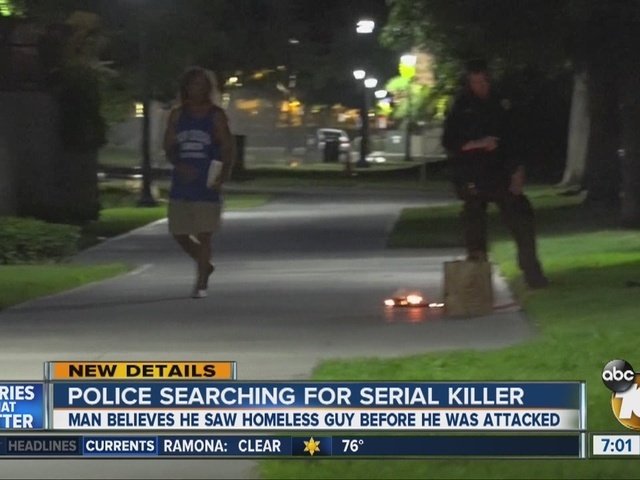 With the attacker still on the loose, authorities have been urging local homeless people to remain vigilant, avoid sleeping alone on the streets and stay in open, well-lit areas. Mayor Kevin Faulconer said there was "no doubt that our city has been shaken by these gruesome attacks." "The last few days have been particularly harrowing and emotional for those who struggle with homelessness," he said this afternoon. "These crimes are being committed against some of our city's most vulnerable people. These crimes are reprehensible." The mayor said the police department was "working around the clock to find this killer and bring justice for these victims." "All resources are being brought to bear to catch this individual," Faulconer said. Nisleit said all available officers and other resources have been committed to the case. "We need to find this person," Nisleit said. "This (assailant) is responsible now for four attacks." The department has received a number of tips from the public regarding the assaults and has been thoroughly looking into them, Zimmerman said. "We are following all leads in this case, but we need the public's assistance to report any information they might have, no matter how insignificant they think it might be," the chief said. 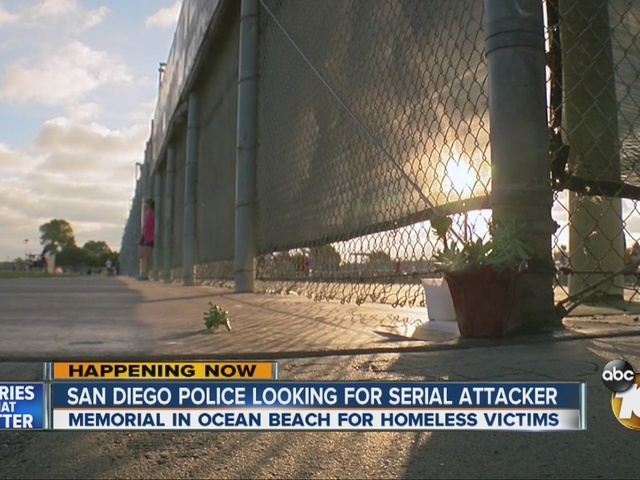 Anyone with information about the cases was asked to call police at (619) 531-2293. Anonymous tips can be submitted by calling Crime Stoppers at (888) 580-8477, or by contacting the agency via email at sdcrimestoppers.org.